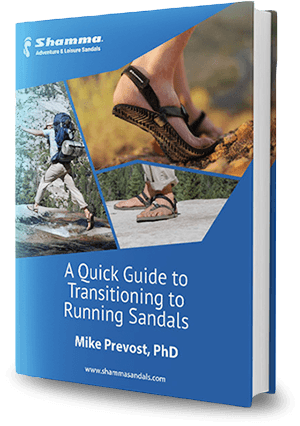 What Are High Performance Sandals? Conventional shoes change the shape of your feet over time. Your toes will splay when given the opportunity, letting your feet relax and take the shape that is most comfortable to them. Your heels, arches, and toes act together like a spring, naturally absorbing energy with each step. Conventional footwear prevents your feet from compressing and releasing energy naturally. Cushioning in shoes dulls your senses, preventing your feet from giving you important feedback about your terrain. Access to your natural senses encourages proper alignment, proprioception, and movement. "Honestly the most fun I have ever had running!" Can sandals be athletic footwear? Running in sandals? How about kayaking, or backpacking? Why don't we usually think of these things when we think about sandals? Gladiators wore sandals, and so did Olympians and marathon runners. So why do we feel uncomfortable with the thought of doing anything without tennies now? "The power straps and the Shamma sandals rock. I just wore my (Mountain Goat) sandals on a 4,200-foot climb of Rendezvous Mountain, here in the Tetons. Thanks for a great product." Shammas aren't like the flip-flops in the back of your car, and they're not like the rest of your running shoes, either. They're built for performance - to do everything that a shoe does, but without cramming your toes into an unnatural box, and without forming your feet into unnatural shapes. You can do anything in Shammas, while also having the comfort and freedom of being in sandals.